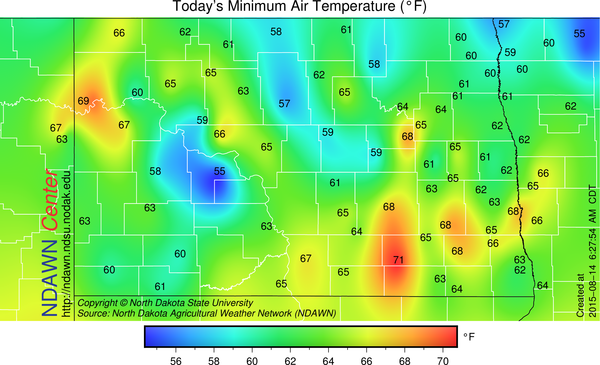 Minimums this morning ranged from the mid 50s to around 70°. Temperatures this afternoon under a sunny or mostly sunny sky are expected to climb into the 90s with some locations in western North Dakota once again recording maximum temperatures at or a bit above 100°. The upper level wind flow has a ridge of high pressure centered over North Dakota, yet, changes are coming this weekend that will cause a dramatic shift to the temperatures in the upper-Midwest. The beginnings of these changes can be observed in the surface analysis below. The cold front that is currently located in Saskatchewan and Alberta will move east/southeast over the next 48 hours and is expected to be in central North Dakota by 7:00 PM Saturday evening. Along the front, thunderstorms are likely to develop and move to the southeast. Along the front the dew point temperatures will also likely “spike” upwards as the low level atmospheric moisture gets pooled along the front. What this will mean is a surge of dew point temperatures into the low to middle 70s for a few hours ahead of the incoming cold front. With dew points potentially that high and temperatures in the 90s, heat indexes may get to 100° or higher briefly, but as the rain approaches the temperature will drop and behind the front much drier air will arrive, so it will be a brief taste of southern heat and “humidity”. The thunderstorms that do pass through will likely contain some severe weather. A watch will probably end up being issued for especially the eastern one-half of North Dakota into Minnesota for this event. 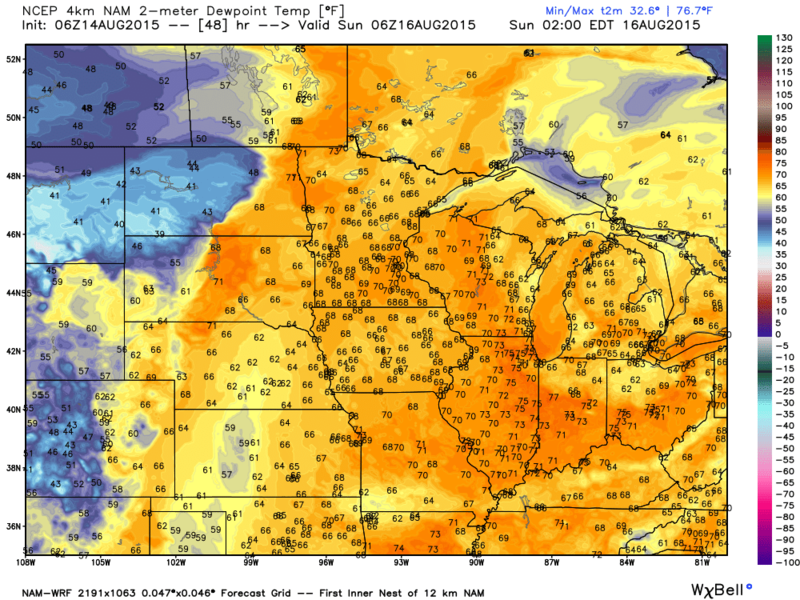 Beyond the cold frontal passage will come significantly cooler air. Maximums in the 70s on Saturday (although southern Red River Valley may do an 80 or very low 80s) with such temperatures remaining in the 70s much of next week (through at least Wednesday or Thursday). As hinted to in the Crop and Pest Report forecast from yesterday, a day with upper 60s in some locations is certainly possible. The transition to cooler temperatures (10 degrees below average) will be associated with a shift in the mean upper-level wind flow that will transition the northern plains into a northwest flow aloft and a trough over the region. 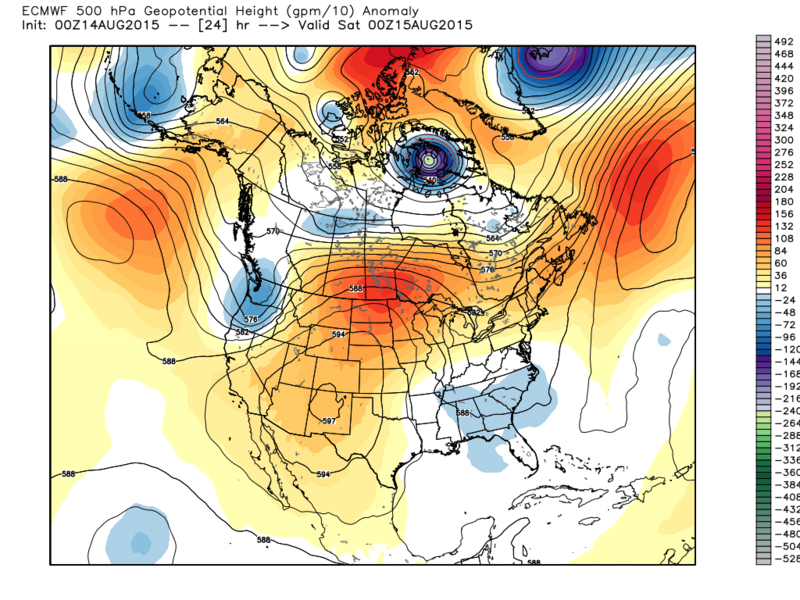 This is expected to last off and on (a few brief breaks) through August 25 or perhaps beyond. With the switch will come potential for a storm next Tuesday or Wednesday that may bring an all-day rain for some parts of the region. 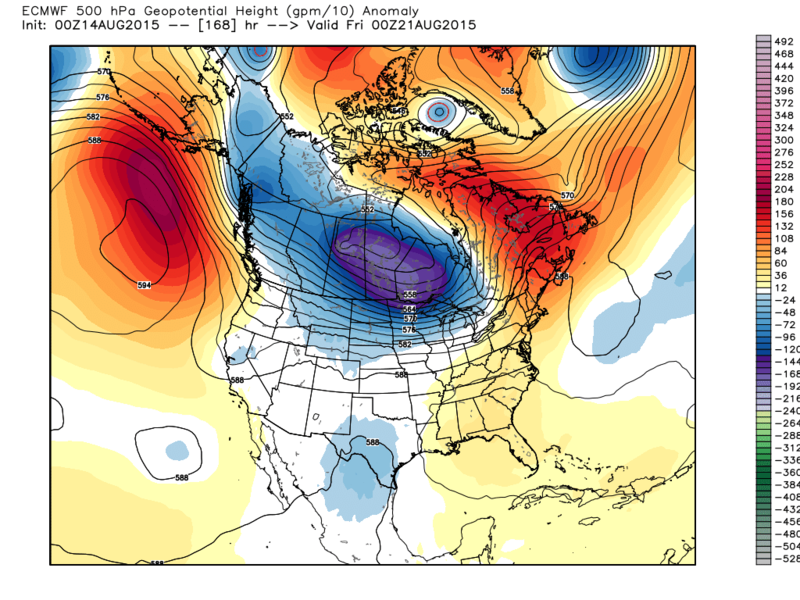 More on that in my blog forecast on Monday.